Welcome to our Luxury Executive 5 Bed 3 Bath villa. Only 10 MINS to Disney. 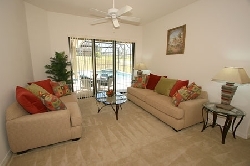 Our Beautiful Villa has over 3100 sqft of fully air conditioned living space. Sumptuously furnished by An English Interior Designer to High Standards, No Expense Spared in making our home the "Perfect" place for the "Perfect" holiday. Our Villa provides a superb combination of very spacious open plan living on one level, with separate living room, Fabulous Master Suite and Luxury Pool complete with Spa. 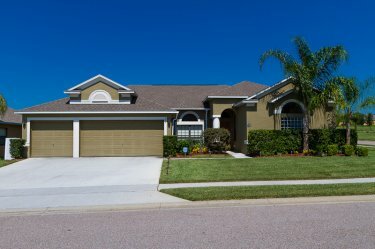 Our prestigious villa is ideally situated for all parks , less than 10 minutes from Disney's new West Gate and some of the best golf Florida has to offer at Champions Gate and the award winning Southern Dunes. Restaurants and Supermarkets are all within easy reach. Upon your entrance to our prestigious villa is through the formal Dinning room and Living room, this room is perfect for those comfortable and relaxing quiet moments, and a dinning area for those�s formal dinner occasions. 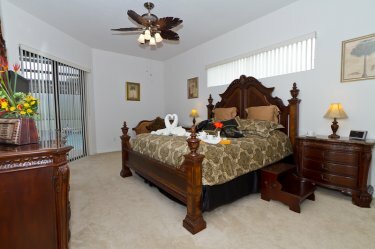 One of the main features of our American home is the open and accessible layout of the villa. In the Family room you are at the centre of the house with easy access to all that goes on. Crash out and watch TV on the 52" HD, or enjoy music or a film from the VCR or DVD player from the entertainment centre housed in a smart unit in this room. Relax and chat with family and friends on the comfortable sofas, the pictures and furniture have been chosen to compliment the light and open feel of the house. There's plenty of space for the extended family to enjoy each other's company at the heart of our home. Maintaining our theme of open and airy space the Kitchen is fully equipped with the top of the range appliances, and has everything you could possibly need, with a full oven and hob including microwave,fridge/freezer and ice maker and dishwasher. Our Kitchen also had a Kitchen Island with lots of surface space for those�s wannabe chefs. 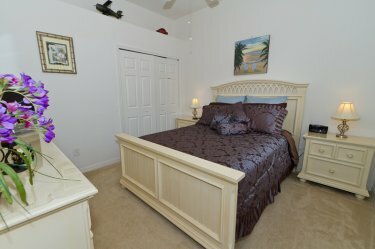 Two Twin Bedrooms, One Bedroom has a Beach Theme and the Other a Floridian Theme, all twin bedrooms have a 19" LCD TV with Integrated DVD Player. We also have a PLAYSTATION 3 in our Beached Themed room, with Games for those�s younger ones. 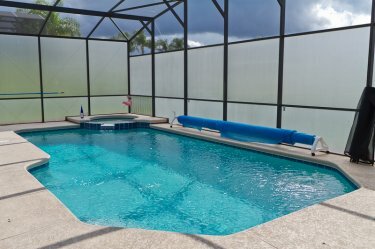 The villa has a 30ft x 15ft screened pool (optionally heated) and fabulous 6 seater spa, presented in a south facing setting, What better way to relax after a hot day in the parks or playing golf, than enjoying the peaceful and tranquil surroundings of Legacy Park. Choose to soak up the sun on the extended decking or sip a cool drink under the larger than average, L shaped covered lanai, plus high quality patio furniture completes the picture to provide just the right balance for outdoor relaxation, day and night. All Linens are supplied, including pool towels. Baby sheets for cot are not supplied due to health & safety. Our Villa Has a SPACIOUS GAMES ROOMS, which is Fully Air Conditioned,Our FANTASTIC Games Room has a range of Professional Pool Table, Table Tennis Table , Airhockey Table, And Darts Board. We also have a crib, crib playpen, high chair, 2 strollers & baby moniter for you to use free of charge during your stay. Our Home is FULLY ALARMED to ensure FULL Security throughout your stay. ( SNOWBIRDS WELCOMED , EXTRA DISCOUNTS GIVEN FOR MORE THEN 2 WEEEKS 7 NIGHTS IS THE MINIUM STAY FOR THESE RATES. !!!!!!!!!! HURRY OR YOU WILL MISS OUT !!!!!!!!!!!! !!!!!!!!!! EMAIL OWNER FOR DETAILS !!!!!!!!!!!!!!! PLEASE STATE NUMBER IN PARTY WHEN EMAILLING.